Buy the DVD Box Set from Amazon! Visit the translation home page! Thanks to Champignon who made the original post about Game Center CX nearly five years ago and got the ball rolling. Imagine if the Let's Play subforum was caught in a transporter malfunction with a Japanese game show. Or if the guys on Top Gear decided to spend their hour trying to beat an old video game. Each week comedian Arino Shinya goes into a conference room and is given an old video game. They won't let him leave until he finishes the game or they run out of time. He starts playing around 10am and he has until about midnight to beat the game. 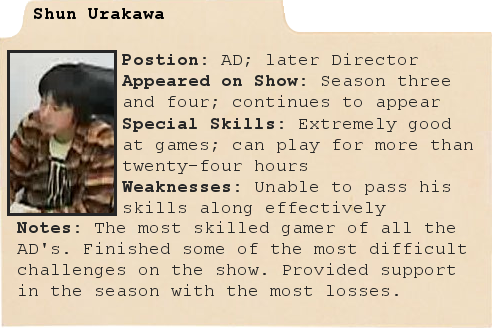 But Arino is not very good at video games. While he's a nerd he hasn't really played video games in a long time. So even easy games are an uphill battle for him. Arino reacts to the games with a good-natured humor. He's cheerful in the face of the worst games. He gets tripped up by the oldest tricks and then laughs it off. And when Arino manages to succeed his joy comes through. When he's not playing that week's game Arino takes trips to local arcades, gets life lessons taught to him from old strategy guides by a monk, calls fans of the show for advice on beating other games, or other even more surreal things. 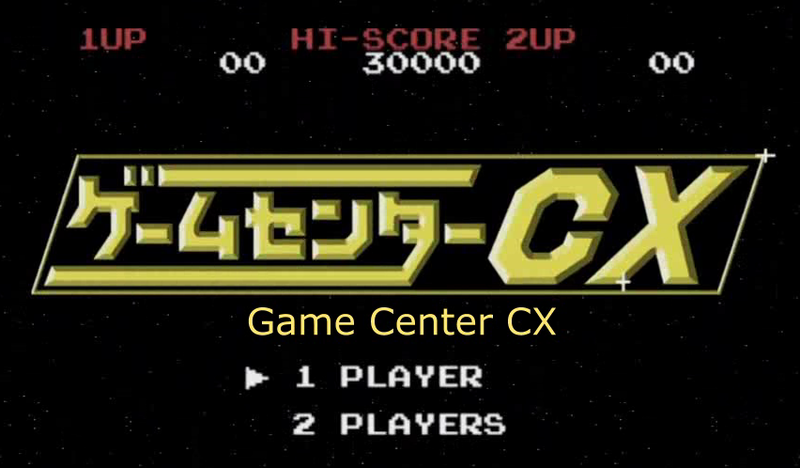 Game Center CX is a celebration of old video games. It's like the days when you got together with your friends to beat a rented game before it had to go back. Isn't this a Japanese show? Yes, it is. Even though the show airs in Japan there's a major goon driven effort that's ongoing to translate the series. The first fourteen seasons are complete shy of one episode and significant portions of the rest of the series have been translated. Where do I watch the show? If you're in Japan and you have Fuji TV's satellite service, it airs biweekly on Thursday nights at midnight. In the US a DVD box set containing twelve episodes previously licensed by Kotaku along with four more additional episodes is now available from Amazon. These DVD's feature a new translation from the SA Team's own zari-gani, so expect the same quality of translation. Or you could download the episodes that are translated as we post them here. 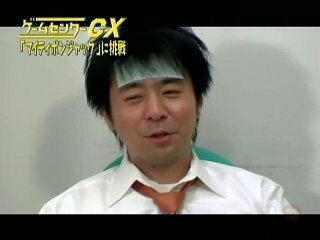 M - The challenge segment from the first season of Game Center CX. LE - One of the live challenges. B - A DVD only bonus episode. NC - A mini episode created for the Nintendo Channel. Italicized episodes have been licensed for an official release and will not be available. I used English names where ever possible and when there wasn't I used a rough translation to give some idea of what the game is like. Similarly the genres are a rough framework. There's a lot of episodes; where's a good place to start? The show doesn't have a whole lot of continuity so you can just pick an episode featuring a game you're interested in and go for it. I would recommend watching an episode translated by the SA Team first. 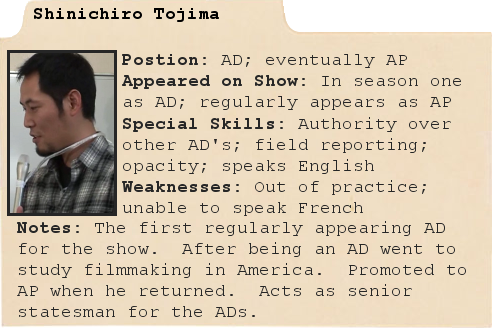 One of the focuses of our translation is accessibility; we want you to be able to enjoy the show even if you don't know a thing about Japanese television, gaming, or culture. Starting with an SA Team episode can mean a more welcoming experience. The DVD set from Discotek media has a translation by our own zari-gani and that's the best way to see those licensed episodes. 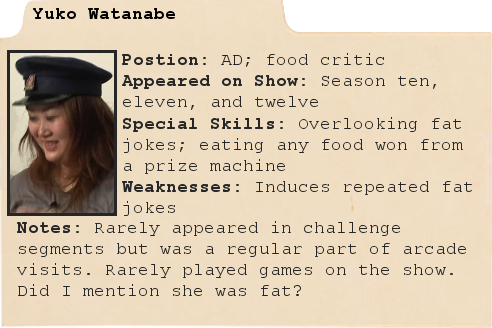 http://www.fujitv.co.jp/otn/gamecenter/index.html - The official website; you'll find episode information here and it's where you go to enter that week's code. http://www.gascoin.co.jp/cx - Official site of the production company; there's blogs here and information on upcoming events if you happen to be in Japan. http://www.crunkgames.com/?p=87 - Ray Barnholt's excellent episode guide. http://www.facebook.com/people/SA-Gccx/100002908560345 – The SA Team's Facebook page which is maintained by Gutcruncher. http://steamcommunity.com/groups/GCCX - The steam fan community which will send you announcements when a new episode is available. 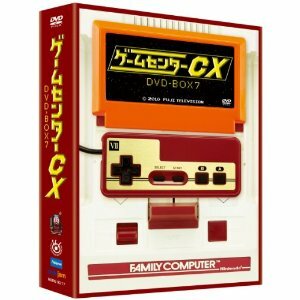 http://forums.somethingawful.com/sh...hreadid=3285054 - The retrogaming thread; if you want to talk about collecting famicom games this is the place for it. http://discotekmedia.com/ - Publisher of the DVD set in the US. Game Center CX is a super low budget show. Arino is the sole star and as a result the crew often wind up being a big part of the show themselves. 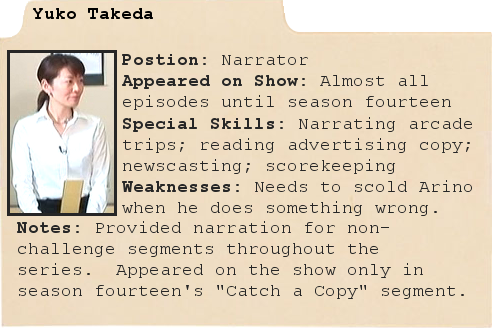 Arino regularly calls for assistance from one of the assistant directors, the show's creator provides narration in order to save money, and the cameraman regularly gets out from behind the camera to pitch in. The most visible crew members are the assistant directors, or AD's. Usually at least once per episode one of them will step up to help Arino through a tough spot. Sometimes they're good at the games, sometimes they just make things worse. The AD's typically work on the show for about a year (one or two seasons) before they move on to other tasks. Several of them have moved up to higher positions in the production company and continue to make regular appearances. On the show they're referred to as AD Name and that has generally been picked up by us even when they've become producers and directors. What's up with the episode numbering? 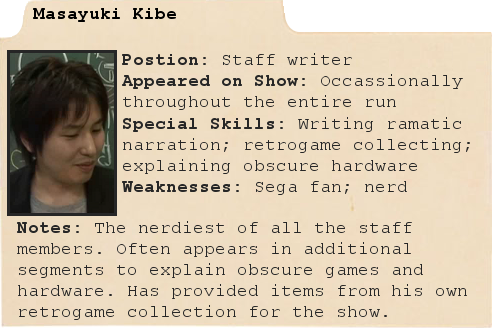 Season one of Game Center CX was a completely different show from what came after. The episodes centered around Arino visiting the corporate headquarters of a game publisher and interviewing major figures involved with developing classic games. 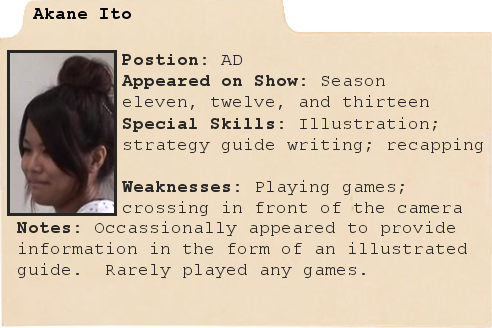 There was one segment in the show where Arino played one of the company's games and was given a special goal for it. After one season and one special the show was retooled. The challenge segments became the focus and the goals changes from things like "Catch seven monsters" to "Complete the game and get the best ending." When this retooling occurred they also officially reset the episode numbering. So in episode guides, the information guides on the channel, and on the website the numbering of episodes starts with season two. Why are episodes nearly one hour long? Don't they have commercials in Japan? They do but Game Center CX airs on a pay television channel which doesn't really have a lot of commercials. Think along the lines of HBO. What are the Nintendo Channel episodes? Much like the Nintendo Channel on the Wii here, the Nintendo Channel for the Wii and 3DS in Japan often features videos about games. A series of short, twenty minute long Game Center CX episodes have been produced for the channel. 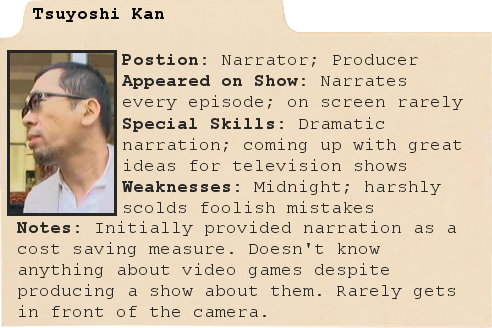 Most of these are challenges but a few of them are just Arino playing around. Some of the episodes are multipart series; the Super Metroid challenge is as long as a full episode. What are the Bonus Stages? There are versions of the episodes edited down to a length for television broadcast that are referred to as Game Center CX - Bonus Stage. The only new footage they feature are the bumpers and they have one or more segments removed. What exactly was the North Trip? The North Trip was a set of replacement arcade visit segments that were used for some reruns. They're all about Arino making a road trip through the very cold northern island of Hokkaido looking for the furthest north arcade. On a holiday special Arino also went to Okinawa to look for the southernmost arcade. What is a revenge attempt? On the most recent two DVD sets Arino and other staff members try to finish a game that Arino could not beat during a regular episode. It looks like this will be an ongoing feature of the DVDs. What are the live specials? There are six challenges that could be considered "live". The first is Mighty Bomb Jack which was a taped episode but the challenge to complete Mighty Bomb Jack occurred in front of a live audience. That episode was the conclusion of a three part challenge; the first two parts were translated for Kotaku while the SA Team translated the final part. There were also four challenges that were presented in their entirety live on television. During these challenges Arino is attempting to beat a game that stymied him in some way before. He receives faxes of encouragement from fans as he plays. The first was the Christmas 2008 challenge of Quest of Ki. Though initially scheduled for two hours Arino played for nine hours. Seven of those hours were spent on one extremely short level. 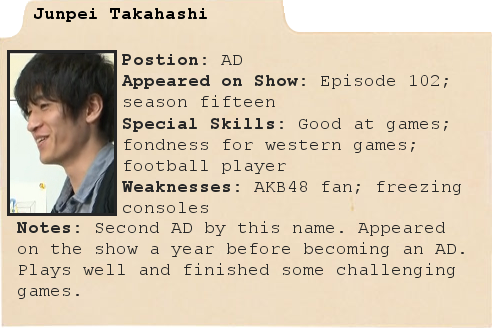 During season ten Arino revisited the original episode and Takeshi's Challenge in a two-hour special. The hour long wait required to complete a segment of the game was handled by using a password. The most ambitious of the live episodes was the twenty-four hour Lemmings challenge. 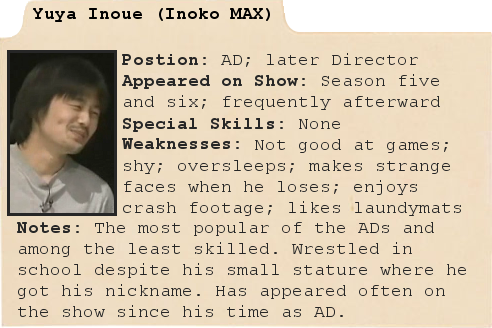 Arino had twenty-four hours to complete insane difficulty. A streamlined version of this challenge was released on DVD. For New Year's Day in 2011 Arino teamed up with his comedy partner Masaru to play Kirby Super Star. The challenge took about seven hours and is notable as the only cooperative challenge that has been done for the show. 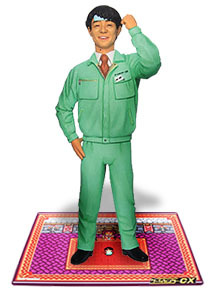 In February of 2012 Arino played Pilotwings for his birthday. He started when he was 39 years old and ended when he was 40. There was a birthday party at midnight that's notable for Arino being presented with art by the SA Team's zari-gani. In addition there was a goon effort to get as many birthday greetings from around the world faxed into the show and they were overwhelmed by outpouring of support by international fans. While the shortest of these live challenges may be translated someday it's extremely unlikely that the long ones will be. Besides the length, the fact that they present the challenge without editing out the "boring" bits means that they're generally not fun to watch. It's Arino sitting there mostly in silence failing the same level over and over again for hours. It just isn't worth the effort. What's that music from that episode? 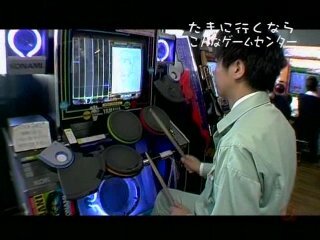 Taken straight from the ridiculously extensive Japanese wiki article on Game Center CX, here's every music used in the show! Junkie XL "JXL Radio Technical Support"
Fantastic Plastic Machine "The King of Pleasure" "Reaching for the Stars"
Cartoons "Diddley Dee" "Witch Doctor"
"Hiwou War Chronicles" anime soundtrack, track 2 "Ikoku no Shirabe"
Chiharu Matsuyama "Oozora to Daichi no Naka de"
Hakase Tarou "Angel in the House"
Candies "Heart no Ace ga Detekonai"
Kenji Sawada "Katte ni Shiyagare"
Onyanko Club "Sailor Fuku o Nugasanaide"
Dragon Slayer: The Legend of Heroes (part of "Castle") [Season 1-3] used during the end with the "incantation"
Bryan Adams "Here I Am"
Simon & Garfunkel "Bridge Over Troubled Water"
AD Tomoaki Nakayama "Last Continue"
AD Yuuko Watanabe "Sayonara Game"
Ben E. King "Stand By Me"
She also created a YouTube playlist featuring the songs. What does the robot voice say at the beginning of the intro? It's one of the great mysteries of the series. There is no definitive answer that I've been able to find. Even the artist who created the music piece that the voice was taken from no longer remembers what it says. What's up with the ending to episode 44? They thought the show had been canceled so the ending of the show is a loving tribute. Fortunately for everyone the sales of DVD's and the licensing of the show for a game kept the series going. What are those things Arino sticks onto his head? They're cooling sheets. The idea is to relieve tension and prevent overheating. They've become his trademark and you'll see him appear wearing them a lot. 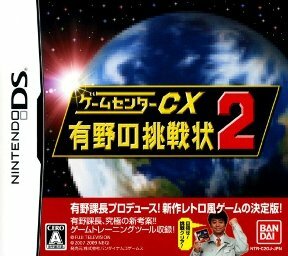 Until recently the only Game Center CX product available outside of Japan was their first Nintendo DS game. 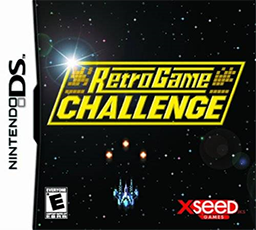 In the US it was retitled as Retro Game Challenge. 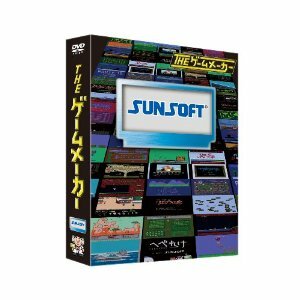 In this cult game Arino sends the player back in time to the 1980's where they have to play some retro-style games and complete challenges to unlock more games. To help you beat the games you could check out gaming magazines for the latest tricks or carefully read over the individual game's manuals. It had eight games ranging from classic space shooters to a full Dragon Quest style RPG. A sequel to this game was made but was not released outside of Japan. It's title is Game Center CX: Arino's Challenge 2. It follows the same formula as the first game but expands the time frame to include some portable gaming and psuedo-16-bit games. Nine new games were featured this time including a Pac-Man style maze game, a mystery adventure game, and a puzzle game. In addition several of the games from Retro Game Challenge returned in special editions. Nine DVD box sets have been released of the series in Japan. Each set contains two DVD's with two episodes on each. Typically one of the episodes in a set is a special extended version of the television episode with additional footage. Each of the box sets contains a special challenge that was done for just the DVD release. The episodes are presented with just the challenge. Other segments may be on the disk but they are not necessarily the ones that were part of the original episode. And every once and a while there is an extra special feature included on the disk. One of the DVD boxes is different; it contains a shortened version of a special twenty-four hour long challenge that has been cut down to fit on two disks. An American DVD box set has just been announced. It's coming from Discotek Media and will feature the same twelve challenges that were previously licensed by Kotaku. They will feature a new translation by the SA Team's own zari-gani. More details to come when they're available. In addition there are a series of related DVD's call The Game Masters. These DVD's are short documentaries about a game publisher. Arino and the show's crew make appearances on these DVD's but they're not part of the series. 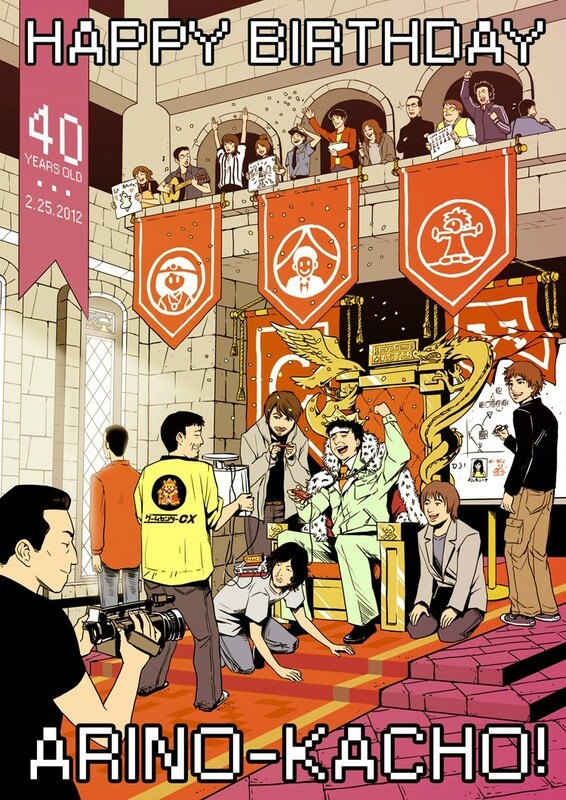 There are five Game Center CX books that feature information about the games, interviews with creators, and behind the scenes information about the show. The third book also features a comic all about the series which has been translated into English. Then there is this beauty. It's been sold out for years and getting one will cost you an arm and a leg. The first group to translate episodes of Game Center CX was TV Nihon. They tend to specialize in live action Japanese superhero shows so they translated the two Ultraman based episodes (episodes 21 and 45). 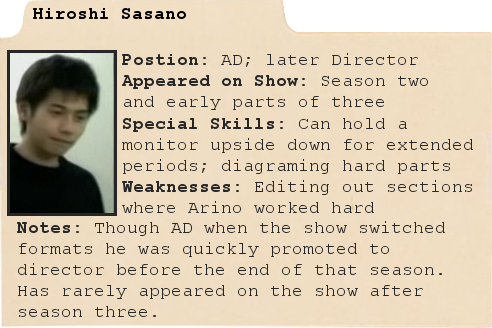 After finishing those they went back and did the Arino's challenge segments of the first season before translating the full episodes of the second season. As time passed their releases slowed down and it was over six months between the release of episode 9 and 10. After episode ten we waited more than a year hoping another episode would show up. Meanwhile over in Japan the DVD publisher Stylejam produced two English language episodes: Mystery of Atlantis and Ghosts 'n Goblins. They used these episodes to try to sell Game Center CX to an overseas market. Stylejam had no success in selling the show and so the only place these episodes have been publicly seen in full is an Asian film festival in New York City back in 2007. Into that void stepped the Something Awful Team. Episodes began getting translated fast and Clover, another subtitling team that happens to have a lot of goons on it, also started working on episodes. About a month and a half after those efforts got off the ground Gawker Media, owner of websites such as Kotaku, Gizmodo, and Io9, announced that they had acquired a dozen episodes of Game Center CX and would be posting them to Kotaku with a dubbed over narration as "Retro Game Master". That began a period of great confusion. The mods gave approval to continue the translation work so long as we did not post licensed episodes. Gawker did release episodes that the SA Team had translated and the SA Team version had to be pulled. Gawker's license was for only for a very short length of time and it quickly ended. The license to those same episodes was purchased by Discotek Media who are releasing a DVD box set with a new translation by the SA Team's own zari-gani. Clover had other translation commitments and weren't able to really work on GCCX so they handed off translations for timing work to the SA Team; they still have one more episode that they're wrapping up themselves but that will probably be their last one. After more than two years TV Nihon released another episode but it's not clear if they're going to keep going or how many years it will be before their next release. Why'd Gawker change the episodes so much? For the most part Gawker was working from the DVD versions of episodes. On the DVD's the episodes are presented as just the challenge segments. So there were no arcade visits or other segments available to them. In one case, Ninja Gaiden, this meant that they had access to an extended version of the episode. What do I do with the subtitle files for episodes? For episodes that were translated and then licensed we had to pull the full video but our translation could stay as subtitle file. If you have a video of that episode you can open it in certain media players (VLC and Media Player Classic work for this) and also open the subtitle file to have it play both at the same time. Please remember that for the twelve episodes Gawker licensed that talking about where to get them is . An e-mail to sagamecentercx@gmail.com will get to me. How do I know a new episode has been released? We've taken on a convention of putting a bit of fan art at the beginning of any post that features a new video. 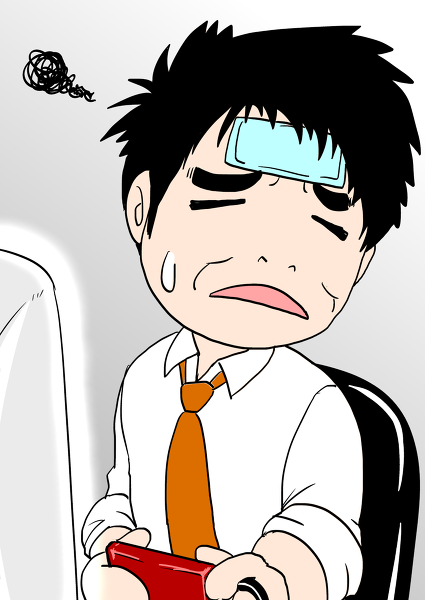 If you see a member of the team post a strange picture of Arino then there's there's something new right below it. Why aren't you guys translating in order? The translators pick which episodes they're most interested in doing. That prevents things from getting bogged down with unliked episodes. The show has very little continuity between episodes so generally it's safe to skip around. Will you guys translate this episode? The long term plans are to translate all the episodes except the extended live episodes. But episode requests generally won't do much good. They're going to get done eventually though. Are you going to translate this episode already done by another group? Possibly but they're the lowest priority as long as there are episodes that haven't been touched at all out there. For episodes licensed by Gawker we could only release a translation anyway (besides, the DVD release of those episodes does have a translation by a member of the SA Team). For a variety of reasons there isn't one. Everyone is working on the show in their spare time and every member of the team has other commitments which have to take precedence from time to time. Also some episodes are a lot more work than others and there's a possibility that an episode will be completed but held back for the sake of other episodes. Why'd you translate that word/title/thing? Everyone knows what it means! One of our big goals in the translations is accessibility. 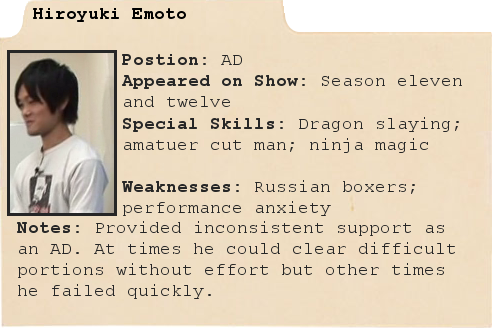 We want anyone to be able to pick up an episode and watch with no assumptions that they know anything about Japan or Japanese gaming. We generally stick to the official US localization of things in games because someone looking up an episode for the sake of nostalgia will be familiar with that. We translated the term because a lengthy explanation while someone is watching a show is more intrusive than translating it. Hey, these guys are reposting your work! We're aware of a few people at various places around the net that are reposting our videos. Since we want as many people to see Game Center CX as possible that doesn't bother us. These people also have not been claiming that they helped translate the episode (with one rather sad exception that got slapped down hard) so it doesn't matter. Besides, we include a URL at the end of the videos that leads right back to this thread. That's great. The team has enough people to handle the timing work for episodes now but more translators are always needed. If you're interested in translating the series send an e-mail to sagamecentercx@gmail.com and I can get into details. Please do not do some work for the show and then get in touch with us about using it. We've got our own workflow and procedures in place and it's very likely that we won't be able to use something created and then handed over to us since it won't match. If you want to help, ask first and we'll explain things. There might be a good reason for that or it might just be that we hadn't considered it. We're open to suggestions; it's not like any of us have ever done a translation project on this scale before. So in news not for the OP there are a few things. First, the bonus episode for the DVD Set 8 is Samurai Ghost, the sequel to Genpei Tomaden which Arino has already played and is also on the DVD. Second, while I don't have a newly translated episode to christen this thread I do have the next best thing: a never before seen episode. 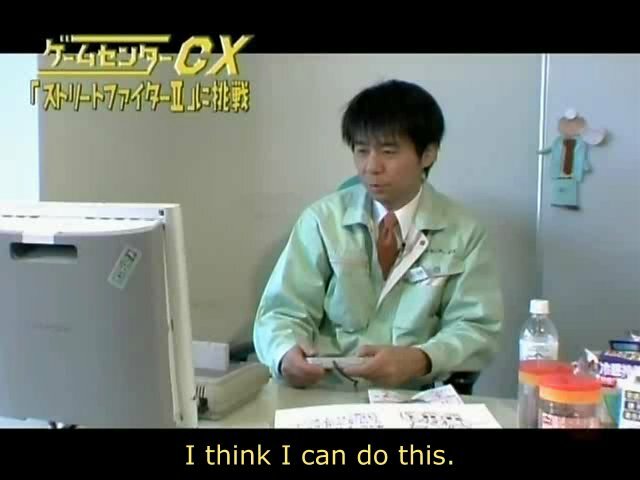 You might recall from a few releases ago that the show mentioned a bonus DVD for the initial release of the DS game Game Center CX: Arino's Challenge 2. That bonus DVD would contain an hour long challenge in which Arino plays the original game. That video had never found its way out of Japan. Until now. This is not translated at all and it's unlikely to be translated anytime soon but it is a new episode that I strongly doubt that any of you have ever seen before. Enjoy. American or Japanese, this is my favorite television show by far. Hope you guys keep churning out those episodes! Oh man, a new thread. the old thread is full of such memories. 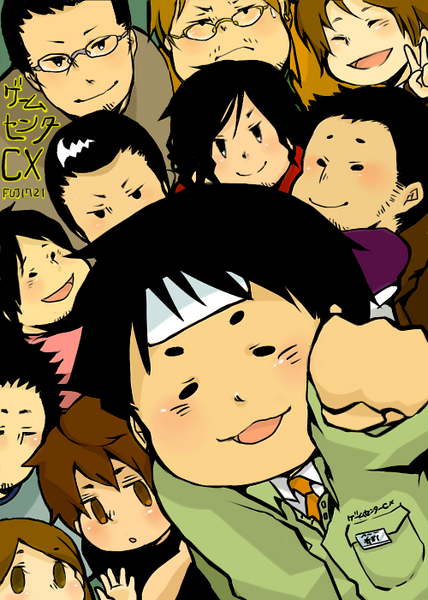 GCCX easily can creep into my top 10 favourite shows of all time. Arino is adorable, and I just love watching him struggle with games. I'm several (Like 15+) subbed episodes behind, hoping that for my christmas vacation, I'll just plow through the ones I've missed. New thread and a new video (untranslated, but I don't care)? Awesome! The only thing that stinks is that the video description reminds me that I should get back to work on my Retro Game Challenge LP that I thought of starting in the previous thread. I took a break from it after running into technical difficulty after technical difficulty, but having a new thread is inspiring me to want to work on it again. I know what you mean... I remember when it was more or less ignored for the longest time before the translation formed and started to do something that I never thought would happen in my lifetime. Thank you again for the many hours of translated GCCX, guys! Glad to see Kotak mentioned in the glossary. This is a great show for anyone who has fond memories of banging their heads against impossible retro games, and the fantastic SAGCCX team deserves endless praise for making it available to non-speakers. I've watched every episode you've put out and I can't thank you guys enough. 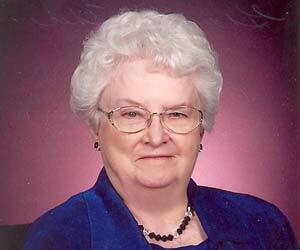 We will make new memories in the new thread. Has anyone heard what the Christmas/New Year's special is going to be this year? Will it be another superlong live challenge or are they scaling things back? The month is young yet, but it doesn't look like they're doing anything. There's a DVD launch event/signing on 12/24 though. I'd also like to repost the news of the fifth GCCX book that's coming out 12/15 and will have another blowout of the USA trip. Am I missing something, or aren't there links to the subtitle files for the SA-and-Kotaku episodes on the big episode/file list? Being NotAmerican, I can't see the Kotaku episodes in the first place, so it's ironically much easier to get the raws and throw a sub file on them. In the previous thread, the subtitle files were up where appropriate, though. Sad to see the old thread go, but I'll follow the new episodes wherever they are. Sadly no, but the ones who stood out from what I saw were rdbbb, who cosplayed as Arino and was interviewed about why he loves the show, and Jetpack Postman, who gave Arino and the staff copies of zari's "America Loves Game Center CX" poster. Can someone translate the challenges for each game he does in the Retro Game Challenge video. Edit: Was his challenge to beat each of the games? Much like with everything else in life, the Euros seem to have more sense on how to do things in a fun atmosphere without sucking the soul out of the event. New thread gonna be better than the old thread. I didn't add them initially for the sake of getting things moving but almost all of them are up there now and the last few will be dropped in soon. Can someone translate the challenges for each game he does in the Retro Game Master video. 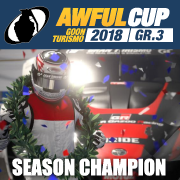 After season one the challenge was always to beat the game. The only exceptions were the Nintendo Channel episodes where sometimes he was given a different goal (beat Concrete Man in Mega Man 9, blow up the big ship in Star Force again, and the like). I'm the one that says 'cheers!' 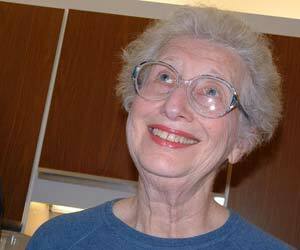 when the camera pans around. So short you gotta be watching for it to even notice it. Had a short conversation with rdbbb about his career and I encouraged Jetpack Postman to be interviewed and play Gunsmoke. Do any of you people own gamingcx.com? They seem to upload to youtube your translated episodes within hours of you posting them here on megaupload and don't seem to give you credit. If y'all aren't involved with them, you should probably have a word with them. Now there'll be some quiet in this town. Great OP, just one minor nitpick: The Arino's comedy duo is called "Yowiko" or "Yoiko" in romaji, not "Yukio." They do some half hearted credits in the very first post (Takeshi's Challenge) but none at all after that, and a lot of people are under the impression that this is their work. It kinda pisses me off, but unfortunately due to the nature of fansubs I feel like there's not a lot that can be done about this. Geez man, you put as much love in those opening posts as the team does the eps themselves. Very nice. Didn't Arino have a twitter account too? The only thing the OP is missing is the fact that no one can agree on what the voice says before the themesong plays. But once again: Thank you for bringing me this show. Every time I watch it I'm filled with warm childhood memories of sitting next to my brother and watching him play Nintendo games. 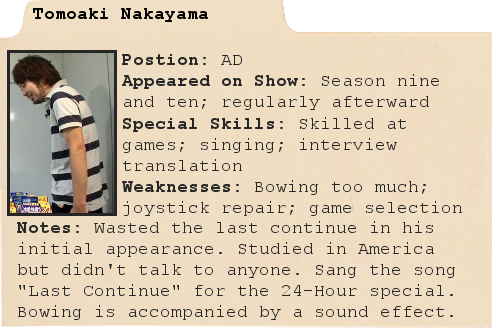 Except my brother was better than Arino. Hell, my four year old nephews are better than Arino. Chiming in to agree with the rest that it's a great OP. Only thing I'd add would be some of the weird complaints from the last thread, or that terrible quote from Kotak's introduction post about GameCenter being what Japan should be (I don't remember it off hand). Go home and be a family man! I cant find the exact quote, but it was something along the lines of "It shows what Japan is capable of when it does things totally on its own!" Looking forward to more uwaaaaaaaaaaaaaaaaaaaaa. I knew that. I don't know what I was doing when I typed that. And the Kotaku quote is "What Japan can do when it tries". Which now that I think about it would have been a great thread title even if we'd be the only people laughing at it. I'm completely open to things to add to the OP. I didn't want to add the Kotaku gripes though because that's not a good way to welcome anyone curious about the thread. Awesome new op Random Stranger, guess this is a good time to say thanks again to the translating team. Does anyone have a copy of the old animated banner ad that you were running for a while? As a way of saying thanks I'll pay for a couple of rotations in the "Goon Ad" space if you can supply that banner. e: It is done, 2 placements running for 2 months, should start appearing within 24 hours I think. ee: It's in rotation now. But he really needed a motorcycle shot. If I had talent Id make a monocle pop off his face. Dug around a bit, finally found it myself. Excellent OP! I'm looking forward to collaborating in new memories. EDIT: Going through the nice list Stranger put up I see Super Mario World was already on third(?) season. I didn't know it was so early on the show, considering it's a high profile game and all. Would love to see it translated some day. Sadly, the turnout of the challenge has been spoiled again and again in various episodes. If anyone's seen it, is there anything otherwise relevant in it? I try to avoid watching GCCX without subs because my Japanese is subpar. I'm going by what I saw and I think these were the challenges. I'm still watching it when I posted this, but I will update the post as I keep watching unless someone who either knows Japanese well enough to translate them and/or already watched it posts a list. I love this show and I love everybody involved in letting me see it. 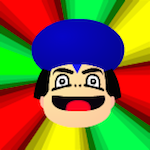 Should see if you can get one of the guys from the GIF thread to stabilize it so his head is still and you can see the expression better. Disappointment to a noble soul is what cold water is to burning metal; it strengthens, tempers, intensifies, but never destroys it. God, it's been a long while since I reared my ugly head 'round these parts. I've been on a Skyrim binge for so long it was difficult to make enough mental real estate for anything else. I even missed when you guys posted the episode I requested, hahahaha (I already managed to watch it. It came out great! ).